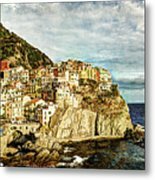 Manarola In The Sun - Vintage Version is a photograph by Weston Westmoreland which was uploaded on July 25th, 2016. 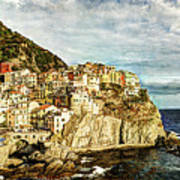 Manarola in the sun, Cinque Terre, Italy. Vintage version. There is a version of this image without the texture. I stopped by these five little villages clinging to the steep slopes of the Ligurian coast of Cinque Terre on my way to Florence. I admit I had not heard about them until I defined my route. I only spent a couple of days there, but that gave me the chance to see those places at many different times of day, some of them crowded with tourists, some of them empty and quiet. 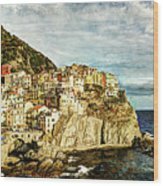 The Cinque Terre show all their beauty when the tourists leave for their resting paces and the sun moves on to light other parts of the world. It is in these moments, or when you leave the center of the villages, when you can breath in the peaceful rhythm of this beautiful and fragile place. I loved it there. I will return.